Belimo Aircontrols' (USA) has good news for those who would like to update their actuators but hate disposing of perfectly functioning globe and butterfly valves. A new line of Retrofit Kits makes it possible to update the actuator and linkage without removing the existing valve body, so a system can be upgraded without major downtime or draining of the system. The kits include actuators and linkage solutions for two- and three-way butterfly valves and globe valves. They can be used to upfit from all major manufacturers including, Siemens, Johnson, Honeywell, Invensys, Bray, Centerline, Keystone, Flowseal, and more. Taking a system off-line to replace numerous valves is not only a laborious-it's expensive. Facilities can lose thousands of dollars a day during a maintenance shut-down. With Belimo's Retrofit Solutions, this problem simply goes away. 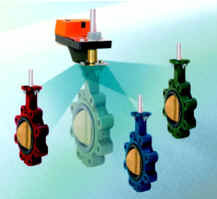 Valves can be quickly and conveniently upfitted without any interruption in service. In fact, entire systems can often be updated in a day. A poorly functioning or even non-functioning system can be transformed into a high functioning, more efficient system in as little as 24-hours. Belimo's retrofits are compatible with all major controls systems, so there's no need to replace other system controls. A 124-page Price Guide and Product Documentation manual from Belimo has complete selection information and installation instructions on the valve retrofits. Belimo Aircontrols (USA), Inc., the pioneer of direct-coupled valves and actuators, specializes in damper actuator and control valve technology for the HVAC industry. For over 25 years, Belimo has provided innovative control solutions to customers throughout the United States, Canada and Latin America. For more information, visit the website at www.belimo.com.